This just in. Christmas is 10 days away! It’s hard to believe we posted our holiday gift guide more than two months ago already. Before you know it, the holidays will be over, and we’ll be looking forward to sun kissed lounging days on the beach! But before then, let’s enjoy what little time left of the holidays we do have. Part of enjoying the present is looking at what an amazing year it has been. Think about all the fun memories you made, perhaps the people you met, and all the goals you accomplished. There is so much to be thankful for, and there’s still so much holiday cheer to spread! Don’t forget to compile a last-minute list of fun Holiday to-do’s, like visit a light display, bake yummy treats, watch a bunch of your favorite holiday movies, or visit Santa at the mall. Another part of enjoying this magical time of the year is hearing and understanding the exciting stories that helped us arrive at where we are today. Where does Christmas come from? Why do we celebrate the way we do? Do other countries celebrate differently? 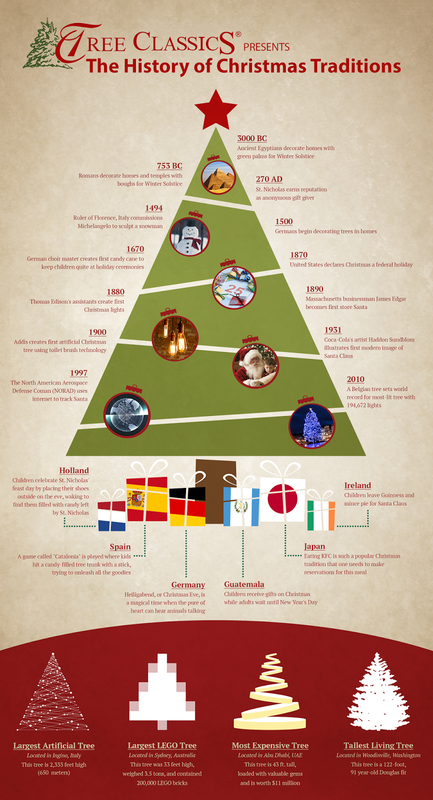 Well, check out this awesome history of Christmas traditions infographic to find out! Special thanks to Tree Classics for the infographic.